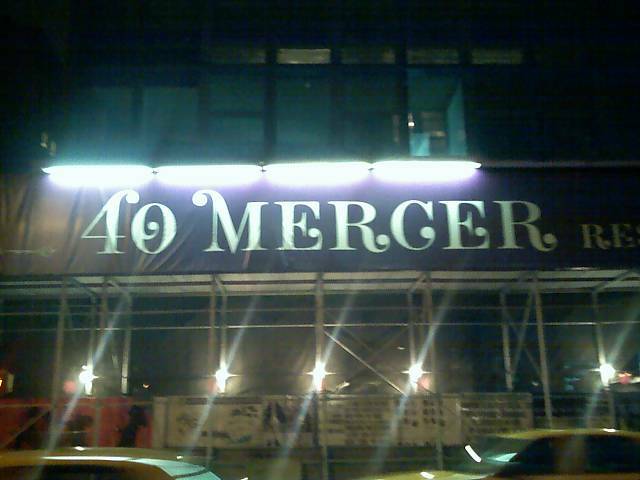 Every day I walk by 40 Mercer, and every day my heart breaks. $5,000,000 apartment envy does that to a person. The worst, worst most merciless part: they are almost all gone. Why do I bother living in New York? I ask myself this more and more. At least, the very least, the building is on block that exudes gaucherie like a heady perfume. That fact soothes me. From there, I popped into Rugby, but even though I was quick, it was that twilight time where the Progressive Reading Series was at 7pm, and it was maybe 6pm, and it didn't make sense to go home just to leave again. So I went for a burger at Old Town Tavern and savored the solitude and a delicious dinner by myself (I am leaving out the constantly ringing phone, multiple crises et al). Then, the reading: it was very good. Sean Wilsey, Ariel Levy, Colson Whitehead and host, the afore-mentioned Steve, got a lot of laughs, which made the evening enjoyable and quite unusual in that it was a reading with five authors and yet not boring at all, not even for a moment. Malcolm Gladwell read from Big Hair, a book by his "cultural hero" Grant McCracken, that actually sounds rather fascinating. Jonathan Franzen read a sublime essay about, among other things, his apartment three blocks away from where I used to live on the Upper East Side, and it reminded me of the time I saw him in a nearby restaurant and he looked exactly like his author photo down to the vaguely repelled expression. After the reading ended, I walked home from 34th Street to several blocks below Canal Street; I just felt like it, I guess. OK, I still heart 40 Mercer forever!! !, and New York, sure, until I find something better. 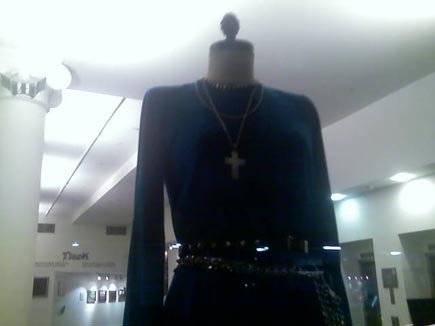 A darling student designed this theatric ensemble and it was on display at NYU. It's like, my 40M fantasy uniform, natch.